This June 6th will see the release of a compilation mixtape with all proceeds going to national suicide organisation Console. The One Life Mixtape Vol.1. 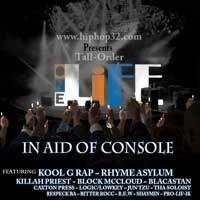 is a compilation mixtape from some of the best national and international HipHop artists with the goal of increasing suicide awareness and raising funds for suicide awareness organisation Console. With the constant rise in suicide going on in the world at the moment and even more so on our own small island, it felt only right to use our own medium of music to raise awareness and some funds to support a topic that is only too close to us all. Paul 'Tall-Order' Ritchie, a Dublin-based emcee, felt he wanted to do something to address the situation especially when its a topic close to him, having lost some friends to suicide. He felt he could use some of his contacts and connections to put together a solid and reputable compilation of relative tracks from known and respected artists to really create as much awareness as possible. Tall-Order reached out to myself here at HipHop32.com with the idea and the project was put in motion,calling on artists for their participation. The response received from the artists contacted was overwhelming with no-one refusing participation in the project. It also became clear that most were unaware of the epidemic proportion of the suicide rate in Ireland. Such a topic is unfortunately only too close to most people these days and there was no shortage of relevant tracks to decide on for the project. The One Life Mixtape Vol.1 is a 20 track mixtape with tracks from major artists such as Kool G Rap, Killah Priest, Rhyme Assylum, Caxton Press, Jun Tzu, Logic and many more. The tracks chosen for the mixtape are all relevant to the topic of suicide and contain some deep felt lyrics from some of the worlds best artists in the genre. 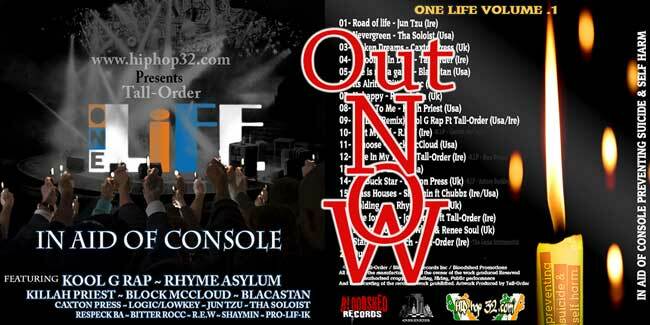 The One Life Mixtape Vol.1 will be available from June 6th for an optional donation price from €5 upwards and can be purchased as digital download via http://www.hiphop32.com/.